New York is the most photographed city in the world. 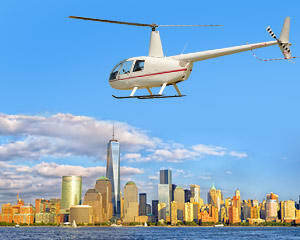 Take a helicopter tour departing from Princeton to capture all the famous sites! Picture-perfect views of the Statue of Liberty, Freedom Towers, Ground Zero, USS Intrepid, Colombia University, Yankee Stadium and much, much more! Get up-close shots of Lady Liberty and a bird’s eye view of Yankee Stadium. An hour and a half of air time means lots of sky covered, so you’ll have the opportunity to shoot it all. This particular flight caters to photography enthusiasts and ensures the sights offered will be warmly welcomed by your lens! The pilot was great, friendly, made us both feel very comfortable also was very tour friendly took us for a great ride and allowed us to make decisions on places we met one that flyover but we left it to him and we were very very happy with the results. he was very considerate too our comfortableness. He explained all safety and emergency Landings to us if anything was to happen which made us feel so much more comfortable that he was very concerned for our safety and our feeling comfortable in the air.